Rock on son, rock on. 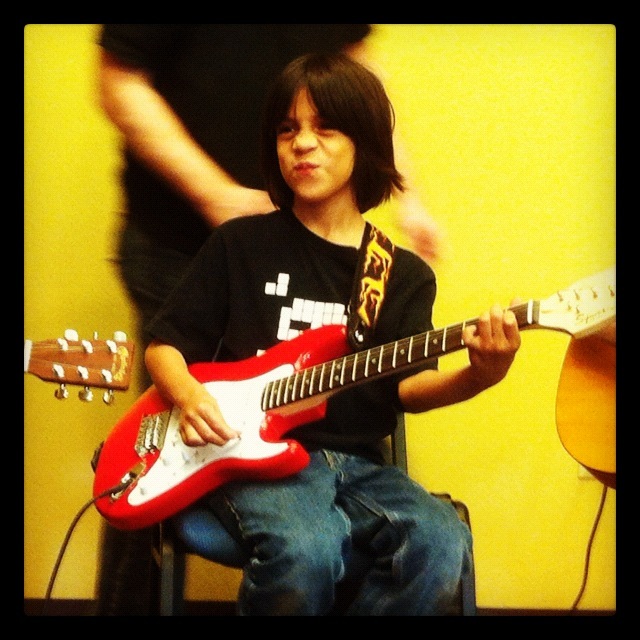 My son had his first guitar recital today. He sat on stage with six other guitar students and the played E, D, and G Major chords along with the Jack Johnson song Broken. Not all of the chords were strung at the same times, and I suspect that a few missed a chord completely. I never played an instrument or took lessons and so I find the way the two kids are taught interesting. It seems that my daughter’s piano teacher started by teaching notes, but my son’s guitar teacher started with chords. It wasn’t awhile into her lessons did my daughter start to learn chords on a piano, but my son has only recently started to really learn notes. He was so nervous before the recital, he almost worked himself into a cry before I talked him down. My older daughter is quiet and shy but doesn’t get the same kind of stage fright that her brother does, or at least if she does, she is much less vocal about it. He ended up doing great on stage, it made me so proud – again. This entry was posted in Instagram, Parenting, Project 366 and tagged chords, guitar, Instagram, music, project 366, recital. Bookmark the permalink.